The stone-colored Hold Force Base Case from mophie is a thin, protective case that wraps around your iPhone 7 Plus and iPhone 8 Plus. The base case has magnetic plates hidden in the back, allowing you to securely attach any Hold Force accessory, such as the Hold Force wallet, folio, or powerstation plus mini. The versatile Hold Force system transforms your iPhone 7 Plus and iPhone 8 Plus into an all-purpose device, allowing you to customize it to best suit your needs. Integrated magnetic plates securely attach any hold force accessory to the base case. Low-profile case provides full-case protection and guards your iPhone from drops and everyday wear and tear. 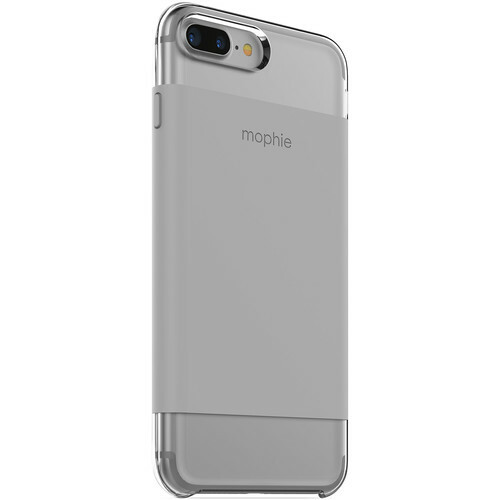 The base case features clear polycarbonate accents that complement the color of the case and highlight the color of your iPhone. Ergonomic design feels great in your hand while raised corners add to the edge-to-edge protection and further protect your phone's touchscreen. Box Dimensions (LxWxH) 7.9 x 4.3 x 0.85"
Hold Force Base Case for iPhone 7 Plus and iPhone 8 Plus (Stone) is rated 1.0 out of 5 by 1. Rated 1 out of 5 by Clay from The magnetic feature is a total and epic failure Overall the case is no better or worse than any other cheap case, but where this one excels in awfulness is with it's magnetic feature: Four dime size magnets hidden beneath the colored vinyl and....wait for it....two of them have opposite magnetic polarity! Let's examine these "features" for a moment: first, with tiny magnets in the corners the middle is not magnetic so forget using it with any magnet accessories you may have like dashboard magnets in your car. Second, the tiny case magnets are over 2" apart so you would need a very large piece of magnetic material if you want your phone to stick to it. Third, one magnet is not strong enough to hold the weight of the phone by itself. Fourth, one side of the phone will actively repel what you are trying to stick it to.